My new favorite ad. Gotta love Lands End. The view from inside my car as I went through the carwash. A picture from the concert we attended last week. During the first part of the concert, the entire choir wore standard choir robes. Then during intermission, they changed into tuxes and ballgowns. We were too far away to get a good picture, but it was really cool and very colorful. Speaking of social media brings me around to Pinterest. *sigh* Such a great site but now I'm quite worried about using it, or rather how I use it. After reading several articles, including these two from the Wall Street Journal, I deleted all my boards except for my personal boards and my tutorial board. I love my tutorial board. Before Pinterest, I was printing out tutes and storing them....somewhere...in my sewing room. Usually impossible to quickly find what I was looking for. So I'm still debating on whether to leave that board or take it down. Violet and Clover wrote a great article as well, and I highly recommend reading it. 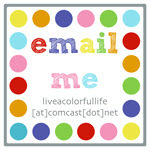 They also included a button to add to your blog, to let people know you like having your work pinned. Okay, on to happier things. My current favorite song. Over 6 million hits on YouTube. I know it looks like you will, but you won't actually see anything too risque....keep going....past the first 51 seconds....I wish I knew how many times they had to stop and start again when they were filming the video. Mark made sure I took a picture of this dog driving the car the other day. Because that's how we do things here in California--we give a driver's license to nearly anyone. Saw this in Barnes and Noble, a Tanagram game, but I'm thinking excellent quilt, both in color and design. My friend, Deborah, brought me this little bit of sunshine yesterday, orange tulips! I've been slowly (very slowly) going through my fabric and precuts, getting ready to list some for destash. In the meantime, Deborah bought a couple of my precuts. Good thing, too, because she helped me get out of hock for buying this fabulous box of color, or colour, as the case may be. Big plans. Once I can make myself actually take it out of the box--it is just so beautiful! Right now, I bet you are asking yourself, "How does she keep coming up with such fabulous random things week after week??" Honestly I think these random posts are becoming the highlight of my week!! I love them!! All fab pictures, the social media made me laugh! Totally jealous of the Oakshott, looks gorgeous!! Enjoy all that fabulous Oakshott! Great random thoughts! I do think that would make a fabulous quilt - color and design! 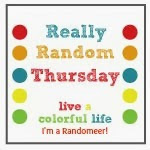 I like random! 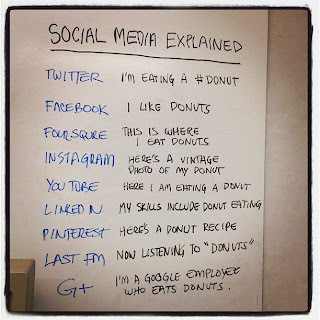 The social media chart is too perfect. I'm with Lucy. Your Really Randoms are a highlight! 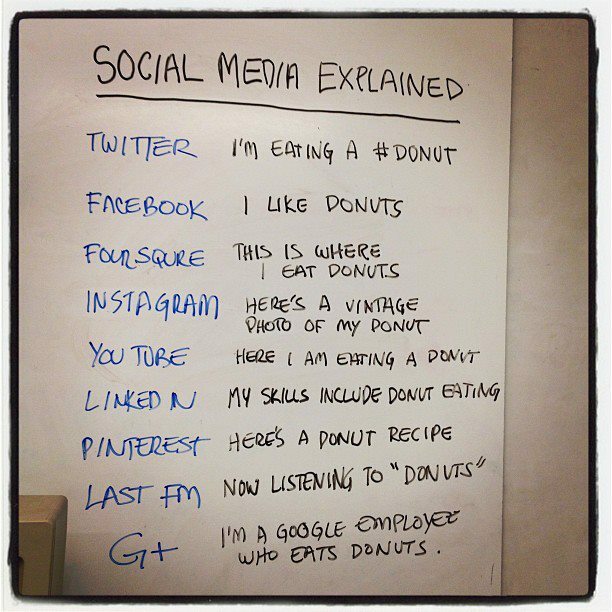 I've seen that social media explained sign - hilarious! Love seeing that huge dog sticking out of the top of the car too. I hadn't seen that Lands' End ad... how very cool! Love your post - I find the whole Pinterest Lawsuit thing absolutely hilarious - I'm sorry, but Americans (stereotype perpetuated in those 2 articles) will sue for being looked at funny! I can't see how linking a picture back to its source and saying something along the lines that you love it or think it's great could be a something to sue over - utter bonkers!! PS Did you see my Gotye mini quilt? You really got me thinking. I love these random posts. I love the Lands' End ad. I love GOYTE. Been listening for a while now and love them. Have worried about Pinterest for a while now. Too busy at work to really deal with it at the moment. It will have to wait until summer, when I can really study it. Thanks for the good links. I'm with Flying Blind on the Pinterest thing. This. Is. Ridiculous. I see my pins as visual bookmarks. They're linked to the original source and driving traffic to it. With the sharing nature of the internet, I think we have to take accept that things like this will happen, or the internet will die. I'm worried this will be another case of overly litigious (and overly cautious) people ruining a good thing and it's making me a little crazy. Also, one thing nobody seems to be talking about is that there IS a way for website publishers to opt out of Pinterest. You install some code on your website and then nothing can be pinned from that site. Flickr users can opt out as well. So if for some bizarre reason someone is really deadset against having their images pinned, there's a way they can prevent it. That's good enough for me.